Our K-9 Angel volunteers & fosters would like to share some recommendations for cleaning up after your dog’s ‘peace and twinkles’. gets a wholesale price on any Young Living product. When we fostered Ford, he was all bones and very sick. It took almost two weeks before he felt any better. By then, we were in love and had become a family. 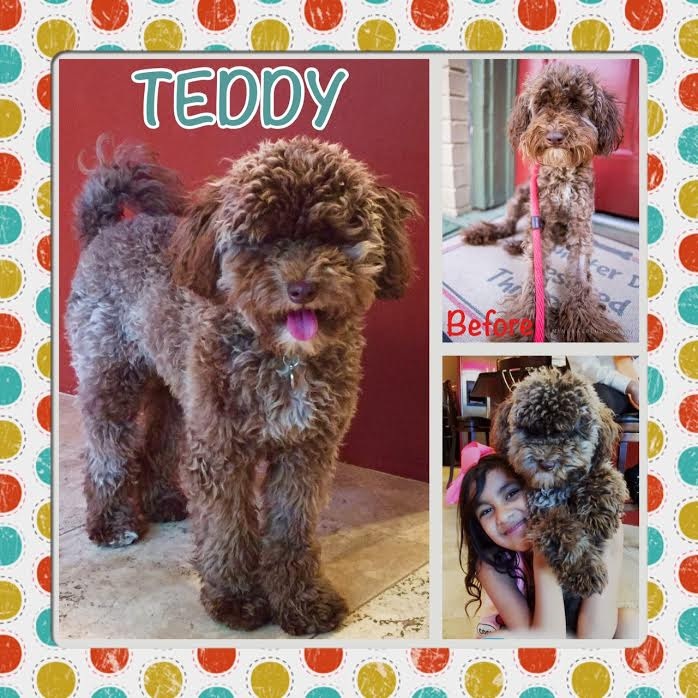 Every day is a blessing with our Teddy Bear. He is so playful, loves to chase the kiddos around the house and follows mama wherever she goes. Thank you so much for the new member of our family! We love him! Darling Daisy has adjusted very well and has gained 6 oz. 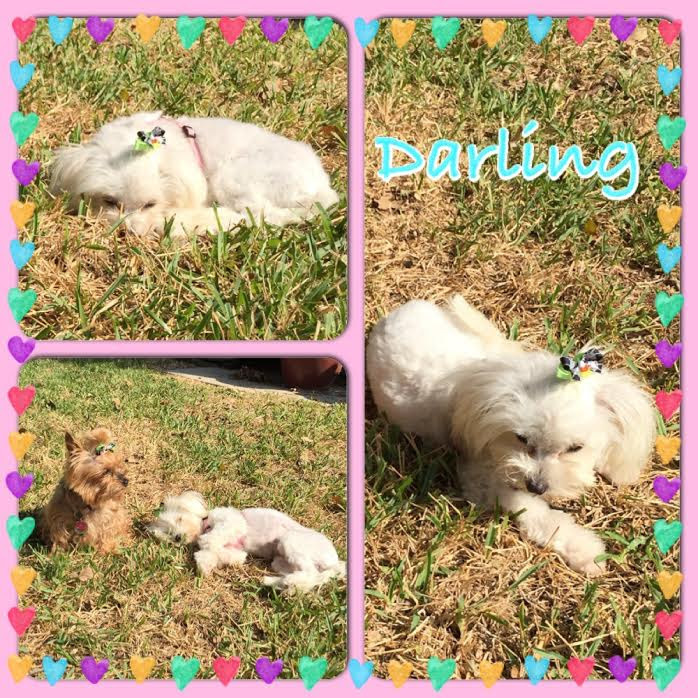 Enclosed are pictures of Darling and Beth (my yorkie.). Again, thank you so very much for rescuing Darling and allowing her to join this family. Wanted to give you an update on Wilma (Alley). She is doing Great and is a little over two feet long. She wanted to pose for you. Thanks again for the wonderful addition to Our Family. It can be very fun for children to dress up as ghouls and goblins. But, dogs don’t understand the concept and can be very fearful of people wearing masks and costumes. And the huge number of children ringing the doorbell yelling “Trick or Treat” can cause excessive barking and put many dogs into sensory overload. In my early adult years, I had a small dog with a heart murmur that had a heart attack on Halloween and died. The constant activity was too much for him. If I knew then what I know now, I would have kept him away from the stress of all of the noisy activity and immersed him with canine sound therapy. Outside of July 4th in the U.S., Halloween is the most popular night for pets to escape their homes. Keep your dog in a quiet back room with some soothing music playing. Or if Buster is near the front door, make sure he’s on a leash held by another family member. Praising and rewarding him for calm, quiet behavior is also invaluable. It will help inspire him to choose to stay inside. For precautionary measures, it’s best to make sure that all of your pets are wearing IDs. While a small amount of pumpkin is healthy for dogs and cats, consuming an entire raw pumpkin can make them sick. And, if it’s a lighted Jack-O-Lantern, you run the risk of your pet knocking it over and starting a fire. Best to go with the battery operated ones this year. Some dogs can tolerate wearing costumes. But, many can’t. If your dog wants to get out of his costume, let him. Make sure all costumes are comfortable and that accessories or buttons are not chewable. Make sure you get your dog out for a good romp during the day and tire her out. Frequent games of fetch along with some extra training sessions can also help her be less reactive during the evening festivities. Protective vaccines are an integral part of the wellness care for our dogs. There are risks and potential repercussions to over and under vaccinating. As a result, many pet owners and veterinarians are using blood testing/vaccination titers to help determine the need for booster vaccinations and to determine the level of protection. Vaccine titers are the measure of the antibodies in the blood stream to a particular disease. Each disease is tested separately. Vaccine titer testing can be done by several different blood tests (VN-virus neutralization, HI-hemagglutination inhibition, ELISA-enzyme-linked immunosorbent assay). HI and VN are the gold standard of testing and are done only through a few labs and veterinary schools. The ELISA test is considered a screening test and is more economical and more readily available. ELISA testing has been evaluated to confirm that a positive result is equivalent to the protective titer level as measured by VN or HI. Well said, and what I’d written about years ago on alt4animals.com (updated version: http://vitalanimal.com/fallacy-of-titer-tests/). Key take away is to not misuse the information that a titer test gives you: a low titer does NOT equal a low immunity in a multiply-vaccinated dog. Useful if you know the limits of the test and use it judiciously. Dangerous if you see a falling titer later in life and think, “Oh oh, Spot is no longer immune — I’d better get more vaccinations!” It seems many respected experts in vet medicine still don’t get this point. Be certain your veterinarian sends blood samples to a major professional veterinary laboratory such as Antech Diagnostics (www.antechdiagnostics.com), Idexx Laboratories (www.idexx.com), Vita-Tech Laboratories (www.vita-tech.com), or one of the major university veterinary laboratories, including Cornell, Colorado State, Michigan State, Tufts, and Texas A&M. How do you get your dog’s titers tested? Many major labs and universities perform titer tests. Your vet likely has a favorite lab and can draw blood and send it for testing for you. Note: some veterinarians resist performing these tests and, as a result, charge more than the going rate at other practices. Although titer testing may cost somewhat more than vaccination in the short run, it is a bargain long term. Titers do not have to be repeated yearly or even every three years. By testing rather than vaccinating, you avoid the risk of adverse reactions from unnecessary vaccines and the accompanying cost of treatment. The more expensive rabies titer need be performed only under special circumstances (such as international travel) or to determine immunity of animals with rabies vaccination exemptions. Large commercial and university labs perform titer testing. Prices vary. Jean Dodds, DVM, is a highly respected veterinary hematologist as well as a pioneer against over-vaccination. She performs titer tests at her Hemopet lab and interprets results. The cost (subject to change without notice) is $52 for both distemper and parvo (tested together) and rabies for $98. Add to that the cost of a blood draw from your vet and sending by mail. Note: Most vets will send the results to any lab you specify. Two inexpensive and quick in-clinic titer tests are now available at a growing number of practices. VacciCheck for CDV, CPV-2, and CAV-2. TiterCHEK®, determines antibody levels to Canine Distemper Virus (CDV) and Canine Parvovirus (CPV) in canine serum or plasma samples. For a comparison, read what WSAVA Vaccination Guidelines Group Chariman Michael J. Day has to say about the two tests. Both provide results in about 20 minutes. Both test kit systems have been validated independently and correlated with gold standard tests by a number of diagnostic laboratories: the TiterCHEK® system (manufactured by Synbiotics and now owned and distributed by Pfizer) and the VacciCheck system (produced by Biogal Laboratories). TiterCHEK® provides a yes-no (protected or not protected) answer for CDV and CPV. VacciCheck provides a semiquantitative score for serum antibody titres against CDV, CAV and CPV. by Dr. Robert L. Rogers, CritterAdvocacy, Houston TX. Vaccinating Dogs: Has Your Vet Withheld the Facts? If you have questions specific to client log-in services and support, please send a message to: support@tvmdl.tamu.edu. is located behind the Vet school, just off University Drive. Driving west down University Drive, go under the overpass at Wellborn Road. At the next light, take a right onto Agronomy Road. Take the first left off Agronomy Road into a parking lot. Drive through this parking lot until it dead ends. TVMDL will be the building on your right. You may park in either of the two spaces marked “TVMDL Visitor Parking” or in one of the two spaces marked “Specimen Dropoff” in front of TVMDL. Mornings and late afternoons are getting darker and darker for many of us this time of year. With the time change coming up, late afternoon and evening walks are only going to get darker! You want to make sure you and your dog are visible to drivers when you’re out and about, so the following are a couple of safety tips to keep in mind this fall. Last October I was driving home in the dark, and a neighbor’s Australian shepherd darted in front of my car as I turned a corner in the parking lot. 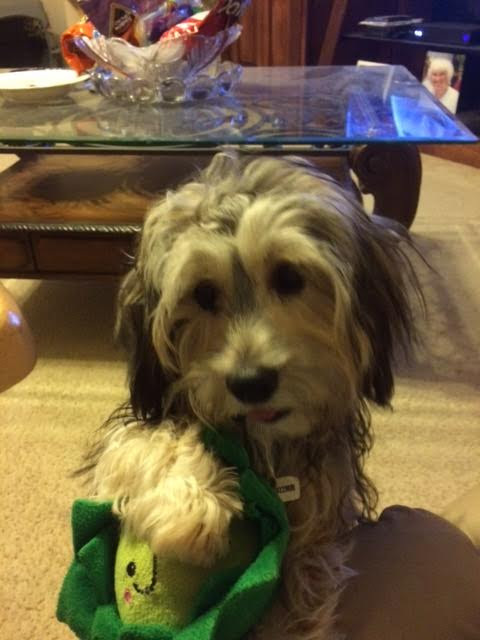 The owner was trailing behind on a retractable leash, totally unaware of what almost happened. Thankfully, I was driving slowly and saw the dog in time. 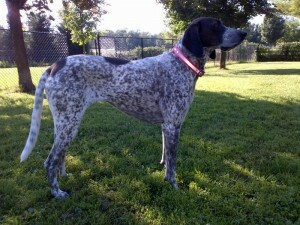 I recommend ditching the retractable leash or at least keeping it locked to a shorter length. A 6-foot leash is a much safer option when walking in the dark so you can keep your dog closer, especially around blind intersections. If you’re waiting to cross a street in the dark and a car seems to be yielding, don’t cross unless the driver actually makes eye contact and waves you across. Unfortunately, we can’t do a whole lot to control drivers if they’re distracted, but we can make ourselves and our pets more visible. You probably don’t have plans to take your dog along for trick-or-treating, but maybe you’ll need to take him out for a short walk. If you do, a reflective collar will help keep him safe on Halloween or any other evening. One of the benefits to a reflective product is they don’t need any batteries, so no replacing or recharging is necessary. The reflective ScruffTag personalized dog collar (pictured) – These collars are made with a 3M Scotchlite reflective strip. The Mendota double braid reflective collar – These are made from polypropylene rope and a reflective strip. There are also reflective leashes available. When I take my dog for an evening walk, I carry a small flashlight in my pocket, which I can easily switch on to make myself more visible to drivers approaching from any direction. This is especially important if there are no sidewalks or shoulders to walk on. A light-up collar will help your dog remain visible to drivers, pedestrians and even to you if you allow your dog off leash. I especially like light-up collars for dark-colored dogs that are harder to see in the evenings, especially smaller dogs. Even if you just let your dog outside into your own fenced yard at night, a light-up color will still make it easier to spot him. 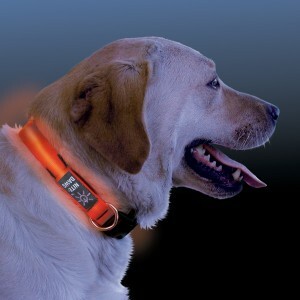 The Nite Dawg light-up LED collar available through dogIDs has two modes – the flash mode or the steady glow mode. You can also order the 5-foot, light-up leash.